This product has been discontinued and replaced by the CPRmeter 2 in 2017. 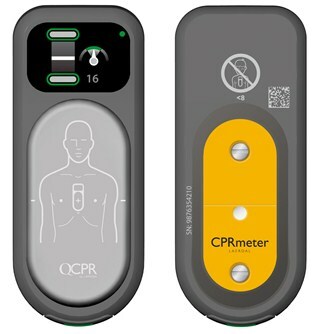 Consumables and replacement parts, for the CPRmeter, will be available until 2022. How can guidelines compliant CPR be delivered consistently throughout the whole chain of survival? CPRmeter™ has two embedded sensors: one measuring acceleration and another measuring force. A sophisticated microprocessor continuously measures both of these parameters during each compression, and special algorithms convert the collected data into meaningful information. The accelerometer measures the depth and rate of chest wall movement during each compression and converts it into distance travelled. The force sensor measures the force applied during CPR and is also used to detect whether the patient's chest is allowed to fully release between compressions. Feedback is provided if the responder is leaning during CPR. This helps the trained rescuer to deliver guidelines compliant chest compressions regardless of the chest stiffness of an individual patient. Its rugged construction and excellent viewing angles, even in difficult environmental conditions, makes CPRmeter ideally suited to the chaos of the emergency situation. 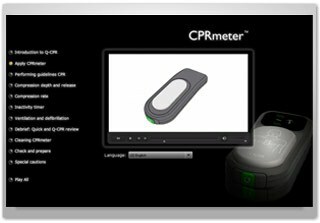 Click to view an interactive presentation containing a number of videos with instructions on how to use and maintain the CPR meter. The videos can be viewed separately, or all together by pressing the "Play All" button. The videos are also available in multiple languages which can be selected from the drop down box under the video screen. The opportunity for trained responders to immediately self-evaluate their CPR performance is both an empowering and motivating feature of the CPRmeter™. This can help reassure that optimal CPR has been delivered or highlight areas for improvement for discussion during the de-brief. 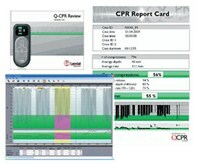 Q-CPR Review software provides the foundation for a successful CPR quality improvement programme. CPR training for both ALS and BLS courses require demonstration of guidelines compliant CPR 12. Studies indicate that CPR skills decrease quickly following traditional CPR training 13,14,15. More frequent refresher training, more hands-on skills practice and reduced intervals of re-certification have been highlighted as methods to address this problem.16 A valuable solution for recommended low dose, high frequency refresher training, the CPRmeter™ used with a manikin can help the trainee to improve and maintain CPR skills, while helping the instructor to easily assess competence for re-certification. The CPR meter helps to guide the trained provider to deliver quality CPR by providing dynamic realtime feedback on essential parameters of CPR. 1. Cobb LA, Fahrenbruch CE, Walsh TR, Copass MK, Olsufka M, Breskin M, Hallstrom AP. Influence of cardiopulmonary resuscitation prior to defibrillation in patients with out-of-hospital ventricular fibrillation. JAMA. 1999; 281: 1182-1188. 2. Wik L, Hansen TB, Fylling F, Steen T, Vaagenes P, Auestad BH, Steen PA. Delaying defibrillation to give basic cardiopulmonary resuscitation to patients with out-of-hospital ventricular fibrillation: a randomized trial. JAMA. 2003; 289: 1389-1395. 3. Vilke GM, Chan TC, Dunford JV, Metz M, Ochs G, Smith A, Fisher R, Poste JC, McCallum-Brown L, Davis DP. The three-phase model of cardiac arrest as applied to ventricular fibrillation in a large, urban emergency medical services system. Resuscitation. 2005; 64: 341-346. 4. AHA guidelines for Cardiopulmonary Resuscitation & and Emergency Cardiovascular Care, Part 4: adult Basic Life Support. Circulation.2005;112(suppl IV). 6. Tomlinson AE, Nysaether J, Kramer-Johansen J, Steen PA, Dorph E. Compression forcedepth relationship during out-of-hospital cardiopulmonary resuscitation. Resuscitation. 2007; 72: 364-370. 7. Dine CJ, Gersh RE, Leary M, Riegel BJ, Bellini LM, Abella BS. Improving cardiopulmonary resuscitation quality and resuscitation training by combining audiovisual feedback and debriefing. Crit Care Med. 2008; . 9. Wik L, Thowsen J, Steen PA. An automated voice advisory manikin system for training in basic life support without an instructor. A novel approach to CPR training. Resuscitation. 2001; 50: 167-172. 10. Wik L, Myklebust H, Auestad BH, Steen PA. Retention of basic life support skills 6 months after training with an automated voice advisory manikin system without instructor involvement. Resuscitation. 2002; 52: 273-279. 12. Chamberlain DA, Hazinski MF, European Resuscitation Council, American Heart Association, Heart and Stroke Foundation of Canada, Australia and New Zealand Resuscitation Council, Resuscitation Council of Southern Africa, Consejo Latino-Americano de Resuscitacion. Education in resuscitation. Resuscitation. 2003; 59: 11-43. 13. Kaye W, Mancini ME. (1986), "Retention of cardiopulmonary resuscitation skills by physicians, registered nurses, and the general public", Critical Care Medicine,14, 620-622. 15. Broomfield R. (1996), "A quasi-experimental research to investigate the retention of basic cardiopulmonary resuscitation skills and knowledge by qualified nurses following a course in professional development", Journal of Advanced Nursing, 23, 1016-1023. 16. Smith KK, Gilcreast D, Pierce K. (2008) Evaluation of staff 's retention of ACLS and BLS skills. Resuscitation;78: 59-65.